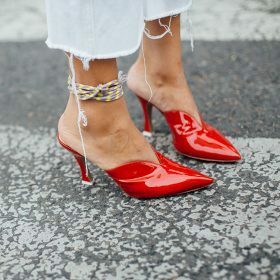 The perfect addition to your footwear collection: a pair of women’s mules are your ideal pair of shoes for a chic meets streetwear look, worn with a pair of baggy jeans, a simple white t-shirt and a logofied Gucci bag. Choose a midi heel for your special dinner date and a flat pair for a Sunday brunch with your friends. English chic meets French nonchalance, a pair of women’s mules is an essential part of your footwear wardrobe - find a pair today!